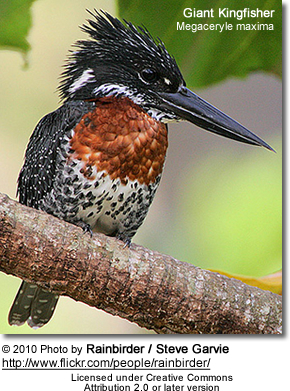 There are two subspecies, M. m. maxima, found in open country, and M. m. gigantea in the rainforest. 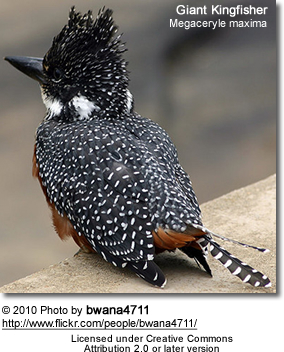 The forest race is darker, less spotted above, and more barred below than maxima, but the two forms intergrade along the forest edge zone. 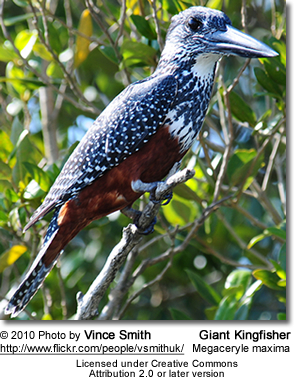 Giant Kingfisher is 42–48 cm long, with a large crest and finely spotted white on black upperparts. 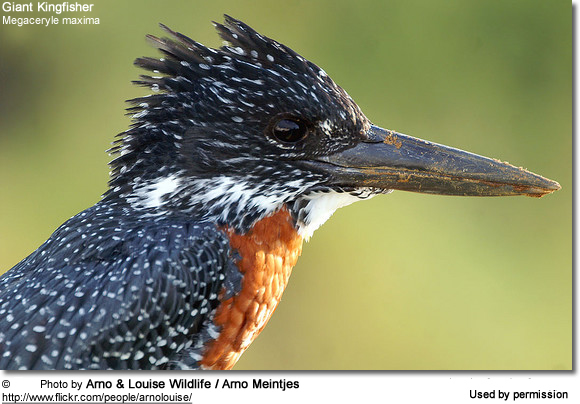 The male has a chestnut breast band and otherwise white underparts with dark flank barring, and the female has a white-spotted black breast band and chestnut belly. 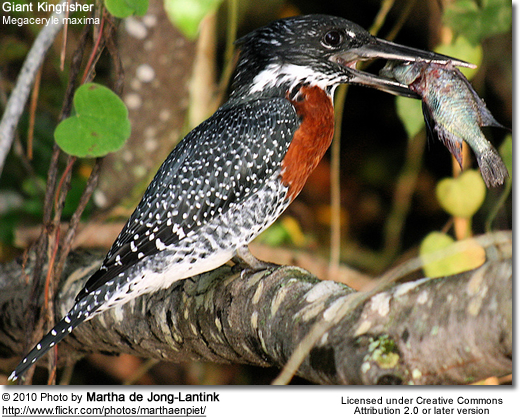 Breeding is from August to January, 3–5 eggs being laid in a riverbank tunnel. The call is a loud wak wak wak. 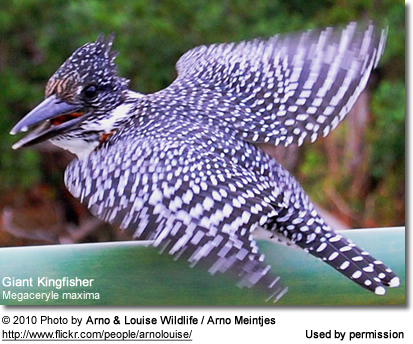 This large species feeds on crabs, fish, and frogs, caught in the typical kingfisher way by a dive from a perch. 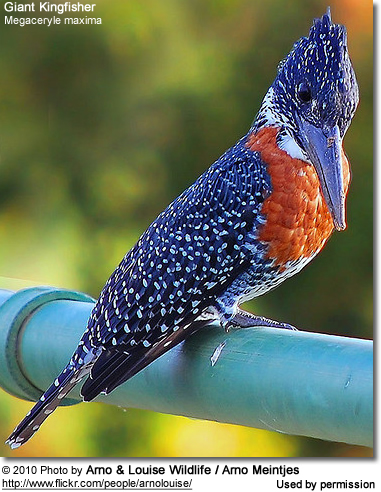 BirdLife International (2004). 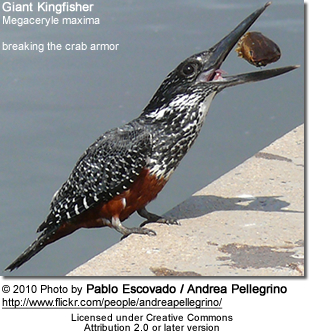 Megaceryle maxima. 2006. IUCN Red List of Threatened Species. International Union for Conservation of Nature (IUCN) 2006. Retrieved on 11 May 2006. 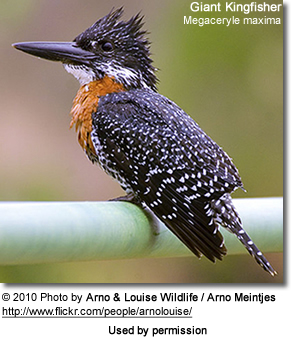 Database entry includes justification for why this species is of least concern. C H Fry and Kathie Fry; illustrated by Alan Harris (2000). 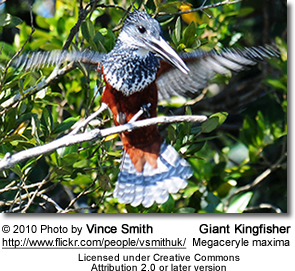 Kingfishers, Bee-eaters and Rollers. Princeton University Press. International Standard Book Number (ISBN) 0691048797.